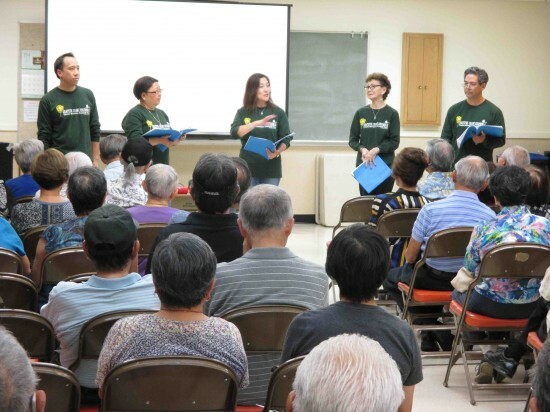 Members of the Grateful Crane Ensemble’s 2014 goodwill tour to Tohoku and Hiroshima sang songs from the tour at a community screening event held on Oct. 4 at Nishi Hongwanji Los Angeles Betsuin. Approximately 100 community members enjoyed the songs and viewed a screening of the tour DVD, which featured group members singing songs for tsunami survivors in the Tohoku cities of Minamisanriku, Ishinomaki and Tome, and for atomic bomb survivors and local residents in Hiroshima. Tour members Jason Fong, June Hayashi and Keiko Kawashima shared their experiences, as did Darrell Miho of Ai Love Japan, who served as the tour’s videographer/photographer and Tohoku liaison. After the songs and testimonials, members of the group took several questions from the audience, many of whom were supporters of Grateful Crane’s “Playground of Hope” project in Ishinomaki. “It’s not often that I get to see where my donation is going,” said one supporter afterwards.